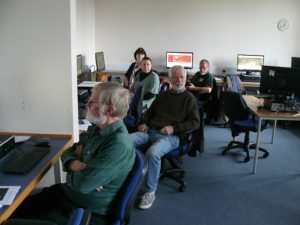 A PC cluster teaching room on the Crighton Campus in Dumfries provided the venue on 9 November for key people from each of the seven Squirrel Groups/Networks in Dumfries and Galloway to learn more about how to use websites hosted by the Saving Scotland’s Red Squirrels (SSRS) project and our independent volunteers’ Forum. The common purpose of these sites is to encourage communication within the growing and dedicated volunteer force in South Scotland, whilst also informing and enthusing the wider public about our work – so encouraging more people to become involved. SSRS has invested heavily in a revamp of its website (https://scottishsquirrels.org.uk/), which now has all the ‘bells and whistles’ we could possibly desire in a new ‘Hub’ for registered volunteers. Gill Hatcher (SSRS Communications & Engagement Officer) showed us how to edit our group/network pages and keep them up to date. We can also use the Hub to administer our membership list, message selected individuals, organise meetings and moderate our own blog space. Following a collective decision at the May 2018 Forum Meeting, we decided to establish our own independent website, which was then set up by James Hall (Annandale Red Squirrel Group: thanks!). Nominated individuals have complete control over their own group/network space. James showed us how to edit these, including a user-friendly facility for changing our operational boundaries on the map, thereby helping to minimise gaps in the overall coverage. As things stand, the area around Castle Douglas can be seen to need adoption, and there are vacant lots for groups/networks all the way from Newton Stewart to Stranraer and beyond! James also encouraged us to post news items with images as often as possible, so that squirrel volunteers everywhere, as well as the wider public, can see what we are all doing to save our reds! Many thanks to Gill and James for encouraging both the technophobes and the web-aware amongst us to use both these websites much more effectively from now on!